Metamorphism is the solid-state transformation of pre-existing rock into texturally or mineralogically distinct new rock as the result of high temperature high pressure, or both. Metamorphism may be regional, involving the burial, transformation, and exhumation of entire regions, or contact, where sediments are transformed by contact with an igneous intrusion. Most regionally metamorphosed rocks are old (i.e. PreCambrian), and most Pre-Cambrian rocks have been metamorphosed. Here in Boulder, the rocks exposed in Boulder Canyon west of town are all regionally metamorphosed PreCambrian metamorphic rocks. The age of metamorphism determined from radiometric dating is about 1.8 billion years (Middle Proterozoic). Metamorphism is usually isochemical, meaning that elements are not gained or lost, just the minerals are transformed. The gain or loss of elements by transport of aqueous fluids in fractures is called metasomatism. Every mineral or mineral assemblage has a range of temperatures and pressures in which it is stable, that is the lowest energy configuration of the elements of the rock. Increasing temperature increases the atomic vibrations of the minerals, and because vibrating atoms occupy more volume than still atoms, high temperature minerals tend to be less dense than low temperature minerals. Increasing temperature also increases the speed at which elements can react to form new minerals. Increasing pressure squeezes the atoms together to eliminate unoccupied volume in the crystal, so that high pressure minerals are denser than low pressure minerals. Pressure can be hydrostatic (the same in all directions) or directed such that it causes a shear deformation of the rock. Shear deformation tends to align platy minerals like mica to form a foliation or needle-like minerals like amphibole or sillimanite to form a lineation. If a rock splits along flat planes of aligned platy minerals is said to have slaty cleavage. If the rock has aligned plates of mica to give it shiny surfaces it is a schist. 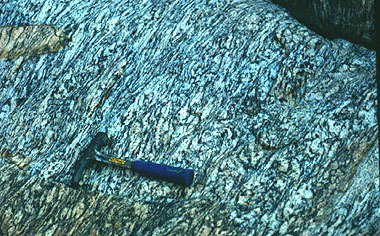 If the rock underwent extensive deformation to segregate light and dark minerals as in the above photo, it is a gneiss. If the rock undergoes partial melting with segregation of granitic melt bands it is a migmatite. A metamorphic rock with an equant texture is a granulite. Most of the sedimentary rocks we discussed in the last chapter have metamorphic equivalents. The halite of evaporites deforms plastically and has a low density (2.1) so it squeezes up to form salt domes before it can undergo any phase change. The different temperature-pressure regimes experienced by rocks are called the metamorphic facies. When a mass of magma is intruded into the crust, the surrounding country rocks may undergo contact metamorphism. Such rocks are called hornfels. In addition to temperature effects, aqueous fluids emanating from the intrusion may cause metasomatism and hydrothermal alteration. Veins of quartz, sulfides of iron and rare metals are deposited in the cooler country rock which is heated and hydrated in the process. Most sulfide, gold and silver ore deposits are formed in this way.